Melt chocolate and butter in a bain marie. Mix flour with sugar and yeast, avoid lumps. Add the cream and two eggs to the sugar, flour and yeast. Add melted chocolate and butter to create a homogeneous mixture. Add the finely chopped black onion. Grease a cake pan with butter or baking spray. Pour into a cake baking dish. Bake at 180 degrees for half an hour. Observe. To determine whether it is ready, the mix should be crispy outside and juicy inside. Mix the two cheeses until they have a creamy consistency. Add the sugar and cream. Assemble, on a rod or cake assembly mechanism. Once the base is cool, cover the top with frosting, leaving the bottom of the tart exposed (for colour contrast). Decorate with honeycomb, or honey, and seasonal fruits. You could also make a honey caramel. (Spread a tablespoon of honey on baking paper, place in the oven at 160º until bubbles emerge, remove and allow it to cool to turn it into caramel). 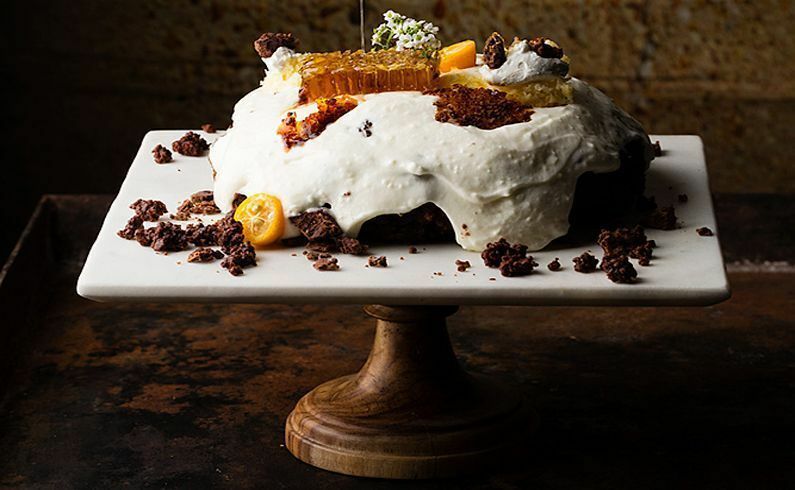 The contrast of black foods, chocolate, onions and beer create perfect harmony with the blue cheese frosting and honey. This tart evokes authentic flavours of home; in the decoration, abandon the perfection of the lines, seeking natural decoration, without forcing. Our family business is located in the village of Montalbán, south of Cordoba. We have dedicated more than thirty years to the farming, production and handling of garlic. The result of our environmental awareness, we are world leaders in ecological garlic production since 1999.